Recently hubby and I took a short trip to Perth in celebration of his birthday. It's always a good idea to celebrate special occasions travelling. We didn't want to go overseas but we definitely wanted to go somewhere tropical, somewhere different because we always end up in Queensland. We decided on Perth. It is very similar to Brisbane - a quite small city BUT with beautiful beaches very close by. Very simple answer - Crown Towers! This place is incredible and is the voice of new standards when we talk about luxury hotels and resorts, particularly in Australia. The spacious and extravagant entrance, the decor, the beautiful crisp scented rooms, THE VIEWS...... its ALL so amazing! A very well thought out property. Our room was overlooking the multi-tiered pool which offers the best views at night, lighting up into fluorescent blue with fairy lights around the palm trees and a stunning sunset view of the city; we stayed in the Premier King room on the 6th floor; it was just magical. 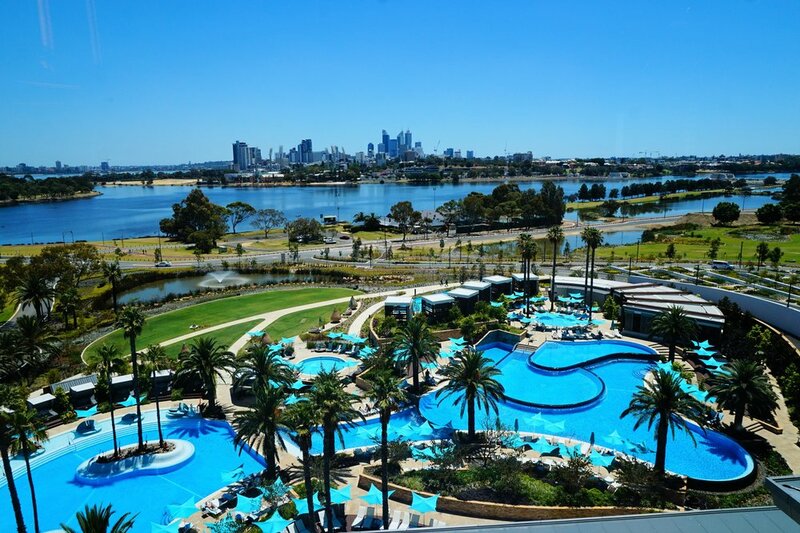 Crown Perth is an integrated resort casino and has 3 hotels, 39 restaurants and bars, resort style pools, private cabana's with private butler, a nightclub and day spa. What I love about the Crown Towers pool is that there is an adults only section with its own heated pool and bar area. We hired a day bed in this area ($125 for 1/2 day) and it was bliss.... so nice to relax, eat and drink. I also have to mention that breakfast at Epicurean and dinner at RockPool Bar & Grill by Neil Perry was just amazing! We were also surprised with a nice bottle of champagne to celebrate with compliments of the hotel manager. Crown Towers has only just turned 1 so the rooms are in top condition, spacious and very comfortable. The rooms are equipped with a tablet so you can adjust temperature, turn off lights, TV and even draw the blinds all from the comfort of your king sized bed. Lounge by the pool - yes! But there are some magnificent beaches in Perth that simply can not be missed. 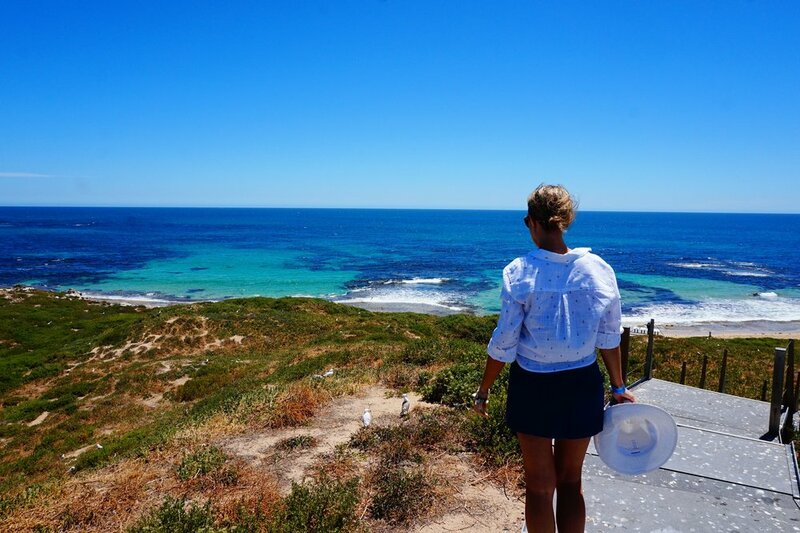 ROTTNEST ISLAND; The most important place you need to see, put it at the top of your list! 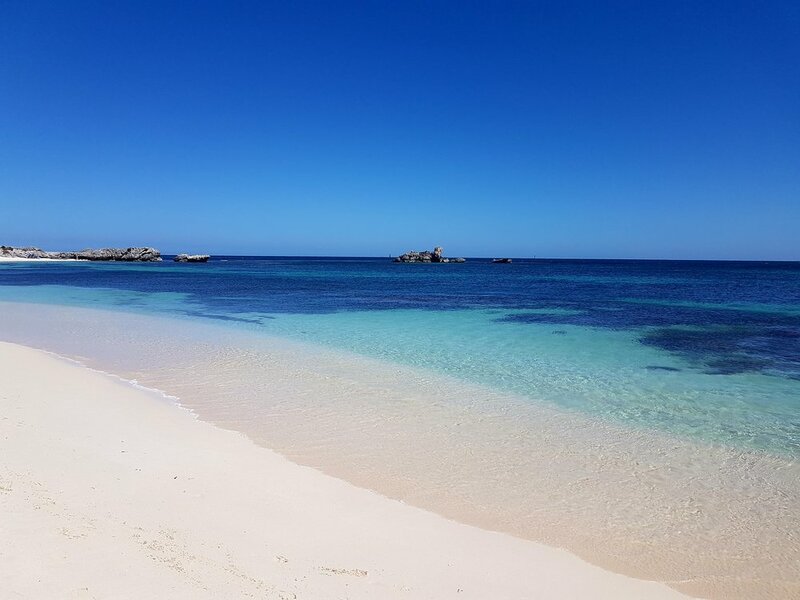 We took a day trip to this breathtaking island via Rottnest Express which is about a 40 minute ferry trip from B Shed Fremantle, costing $40.00 per person, return (this was on sale 2 days before so keep an eye out on their website as they do deals on a regular). Fremantle is approx 20 - 25 minutes from Crown Towers Perth. To find some of these amazing beaches you have to be prepared to ride a bike around the island. You can hire these bikes on the island for $30.00 per person, per day. We hired ours through Pedal & Flipper. I recommend venturing up the north coast and not the south as the south was really windy on the day we went. My favourite beach was Parakeet Bay - one of the best beaches I have seen. (Pictured below). PENGUIN ISLAND; is also a cute place to visit with a few nice beaches and many, many birds! If you're into sight seeing, I'd recommend doing a day tour. We did the Adventure Cruise costing $85.00 per person, return and is about a 90 minute cruise taking you to see the Dolphins, the Sea-lions and then stopping at Penguin Island to see the Penguins and enjoy the beach. Seeing the dolphins was the highlight for me, they surf the waves from behind the speed boat. So cool! Fremantle; has some great eats, one place in particular i'd love to mention; Bathers Beach House . Its got its own private beach where you can chill out with a juicy burger sipping cocktails all afternoon watching the sunset. We only had time to stop here on our last day for a burger (which was delicious) so we didn't have time to enjoy the day beds and sunset. Scarborough Beach, Perth; Just beautiful, however the esplanade is currently undergoing renovations at the moment. I can imagine how amazing it will be when its finished. Pinnaroo Point is a dog beach we came across on our last day on a random drive. It was so much fun, so many dogs and the water is the best I saw on the mainland. It is ideal to hire a car just so you can get around to some of those beautiful beaches. We also ventured out to eat breakfast for a little variety. I would also recommend staying at Rottnest Island for at least 1 - 2 nights if you can - that bike ride is epic, and there is just too much to enjoy.